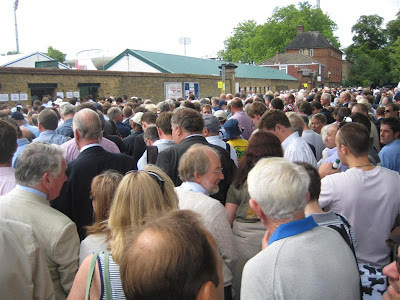 Queuing to get into the ground. The match was a sell out as always. As previously mentioned I went on my annual visit to Lords cricket ground to watch the first days play of the Test match between England and Australia. To the uninitiated a Test Match is an international cricket match which lasts five days. 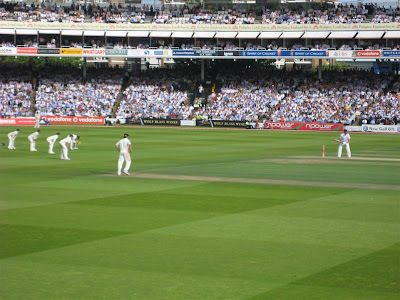 The Test series of matches (usually five or sometimes six matches) between England and Australia are collectively known as "The Ashes" and are passionately fought for. 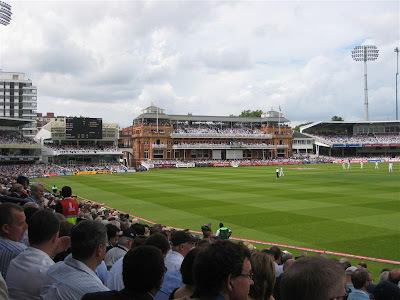 The term "Ashes" was first used after England lost to Australia - for the first time on home soil - at The Oval (another London cricket ground) on 29th August 1882. A day later, the Sporting Times carried a mock obituary to English cricket which concluded that: "The body will be cremated and the ashes taken to Australia". The concept caught the imagination of the sporting public. A few weeks later, an English team, captained by Ivo Bligh [later Lord Darnley], set off to tour Australia, with Bligh vowing to return with "the ashes"; his Australian counterpart, E. Murdock, similarly vowed to defend them. During that tour a small terrecotta urn was presented to the England captain by a group of Melbourne women. 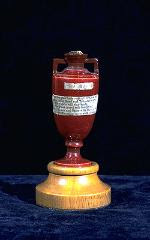 The contents of the urn are reputed to be the ashes of an item of cricket equipment, possibly a bail, ball or stump. Whichever side holds the Ashes, the urn normally remains in the Museum at Lords. The packed stands eagerly await proceedings. Lord's in my opinion is a truly magical place and has long been seen as the 'Home of Cricket' and the game's spiritual 'headquarters'. Cricket has been played here since 1814. But its importance is not merely historical. In practice it remains, to this day, perhaps the most important single place in world cricket. 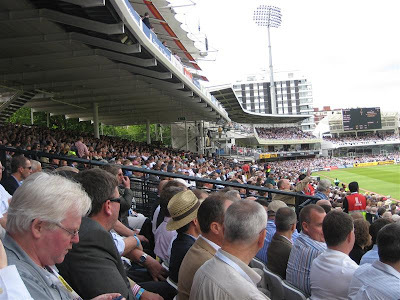 Lord's is the setting for some of the best cricket in the world. 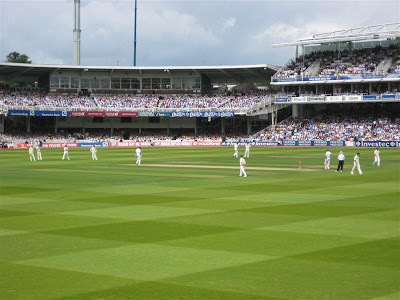 It hosts npower Test matches and NatWest-sponsored one-day internationals plus most of Middlesex's home games, some historic fixtures (such as Oxford v Cambridge universities) and the village and club finals. The hallowed earth that is Lords cricket ground. The slip fielders hoping for a catch. 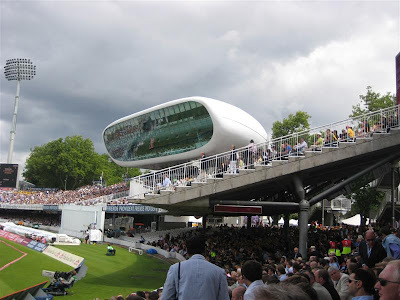 This is the media centre at Lords-known as "the Cherie" a reference to Cherie Blair's unflattering smile! Very unfair.....not! Andrew Strauss celebrates his century. 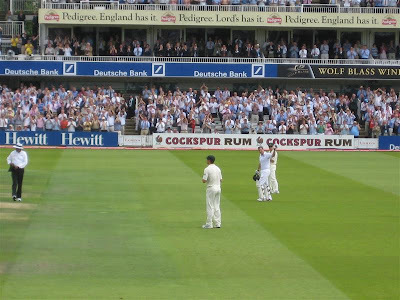 The postscript to this post is that England defeated Australia in this Test to take a 1-0 lead in the Ashes series. It was the first time that England had beaten Australia at Lords since 1934!